How can I withdraw the money I’ve earned through selling domains? The amount of money you earned by selling domains is shown as Marketplace Earnings and is normally eligible for withdrawal after 5 days of a waiting period. 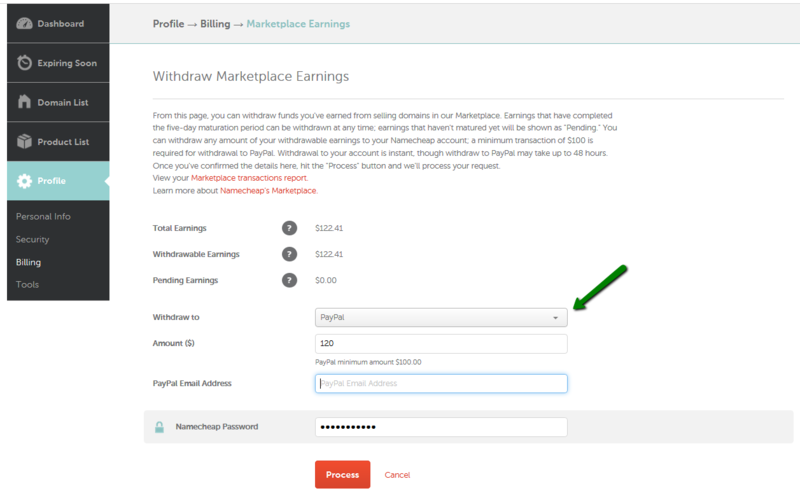 By clicking on the button Withdraw, you can check when the earnings will be available and transfer them to either your Namecheap funds for new purchases, renewals, etc., or to your PayPal account. For PayPal, there is a minimum amount requirement which is currently set to $100. NOTE: PayPal may also apply an additional fee if you are a non-US recipient. The amount of fee depends on the destination.